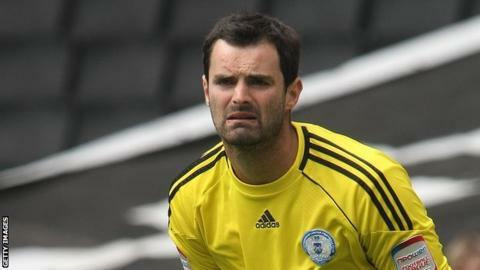 Peterborough United goalkeeper Joe Lewis has agreed to join Cardiff City. The former England Under-21 player will join up with the Championship club as a free agent on 1 July, after signing an undisclosed deal. Lewis joined Posh in January 2008 from Norwich City, having spent loan spells at Stockport County and Morecambe. The 6ft 6in stopper made almost 190 appearances for Peterborough and will contest the goalkeeping position with David Marshall, another ex-Canary. Cardiff needed to strengthen their goalkeeping options after releasing Tom Heaton earlier this month, along with defenders Lee Naylor and Paul Quinn. Marshall was Cardiff boss Malky Mackay's preferred choice between the posts in the league last season and the Scotland international has recently signed a new three-year deal.